A jury in Dallas, Texas, has awarded ZeniMax Media Inc. a total of $500 million in its 2014 lawsuit against Oculus after determining that co-founder Palmer Luckey violated a non-disclosure agreement (NDA) he had previously signed with ZeniMax. The structure of the half-a-billion dollar award is as follows. Oculus is to pay $200 million for breaking the NDA and another $50 million for copyright infringement. Lucky, meanwhile, is required to pay $50 million for false designation, as is Oculus. Last but certainly not least, fellow Oculus co-founder Brendan Iribe has been ordered to pay $150 million. Worth noting is the fact that the jury found Oculus not guilty of misappropriating ZeniMax trade secrets. The jury came to its decision after deliberating for two-and-a-half days according to Polygon. Both Luckey and id Software co-founder John Carmack were in the courtroom today when the verdict was read, Polygon added (ZeniMax is the parent company of id Software and Carmack is the current CTO of Oculus). A spokesperson for Oculus told the publication that the heart of the case was about whether Oculus stole ZeniMax’s trade secrets, adding that the jury found decisively in their favor. To that end, the Oculus rep said they were obviously disappointed by a few other aspects of the verdict but remain undeterred and plan to appeal the ruling. 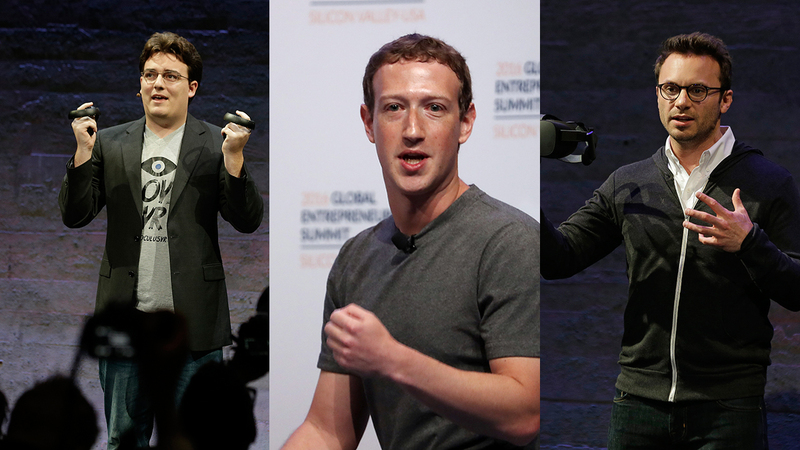 Images via AP (Palmer Luckey), Getty (Mark Zuckerberg) and AP (Brendan Iribe). Mock-courtesy Gizmodo.